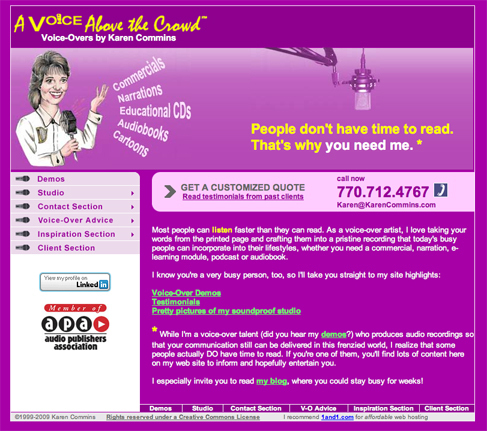 Web sites depict a small corner of one’s imagination, especially when branding yourself as a voice talent. As a voiceover artist and a person, I continue to evolve, gaining knowledge and skills to be of service to clients, family, and friends, as well as those who are interested in becoming voice actors. My web site and changes in my unique selling proposition (USP) reflect the progress in my evolution. I’m reviewing them here with you in hopes that this post will spark your imagination in your own evolution as a voice talent. After starting my business in 1999, I quickly realized that a web site would be a necessary means of attracting clients. I designed and maintained the first version of my site. Yes, it is quite colorful, but at least I used a consistent font throughout my web site and on all of my printed materials. 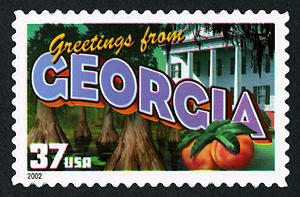 Note that I still use that graphic as the little, custom picture that appears on the address line in your web browser. This picture is generated from a file on my site named favicon.ico. The advantage of the favicon.ico is that it helps your site stand out among your clients’ many bookmarks. Creative Sound Concepts provides a good explanation of the favicon.ico and how you can create one for your site. Like you, I’ve read all kinds of advice about not including a picture of a microphone on my web site. People in creative industries, especially in advertising, consider microphone pictures on voice talent web sites to be tacky and outdated. While I’m sure that’s true, no one ever said that they didn’t want to hire me because I had a microphone on my site. Of course, I don’t know whether it actually drove people away. One thing that I do know is that you should choose your USP wisely. 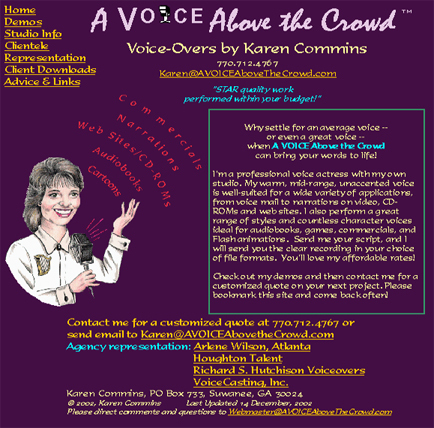 My original USP was STAR quality voiceovers performed within your budget! The good news is that this USP attracted clients. The bad news for me was that the USP generally attracted clients who were shopping for voice talent solely on the basis of price. As I wrote in a previous entry, I have so much to offer my clients that competing only on price is not an option. 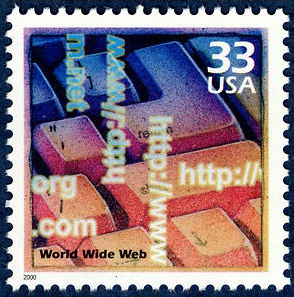 When I moved to my second web site, I changed my USP as well. At times, I used the line on my site: People don’t have time to read. That’s why you need me. However, a USP or tag really needs to be a short, memorable phrase. I later promoted myself with the tag Eloquent voice to enlighten and entertain. (I admit it; I love alliteration!) This tag took the focus off of price and emphasized something about my thought process and speech patterns, but does it really describe my voice? Probably not. Does the tag really need to describe my voice? I thought about the answer to that question during intense coursework spanning over 2 years with my wonderful coach and branding expert Nancy Wolfson at BrainTracksAudio. I concentrated on learning to analyze patterns in advertising copy so that I could provide bookable and consistent interpretations. Through my lessons with Nancy and her delightful associate, acting coach Jeff Freeman, I also learned once again that other people don’t hear us or think of us the way we think of ourselves. My voice is only one part of me, and my branding efforts need to encompass the whole person. Finally, I finished my coursework and was ready to create a new commercial demo. I stopped marketing my previous commercial demo in September 2007, so reaching this point was particularly exciting to me. 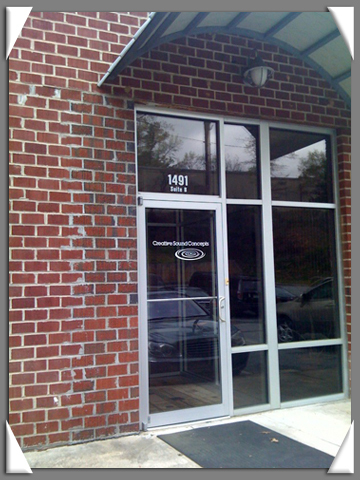 On 10 April 2009, I was very excited to walk through the doors at Creative Sound Concepts here in Atlanta. Although I had talked with owner Spencer Herzog through the years, I had not had the opportunity to visit his fabulous studio or work with his great team. I was there in April to record my long-anticipated — and, might I add, AWESOME! — new commercial demo under Nancy’s direction. My commercial demo was produced by Rick Santizo at Santisound in Los Angeles. Bill Morrell was my gracious and very capable engineer in Atlanta. As a technical side note, SourceConnect, rather than ISDN, was used to connect both studios. I had unplugged my ISDN line almost 2 years ago due to lack of use. I haven’t had any requests for SourceConnect other than in my demo session. However, I may acquire an account as it seems to be an affordable alternative to ISDN, and it is gaining a larger presence. With my new demo in hand, the next step was to create an image that would match my voice, style, and personality. Nancy recommended that I work with the very talented Jason Sikes, graphic designer and owner of Village Green Studios in Los Angeles. Nancy played my demo for Jason and discussed her views of my brand. Leaving my branding image to Nancy’s and Jason’s imaginations allowed these 2 creative geniuses to develop an amazing new image that represents me on multiple levels! My printed materials like note cards and business cards have the same luscious image. With this design, you know that I’m also planning postcard mailings! 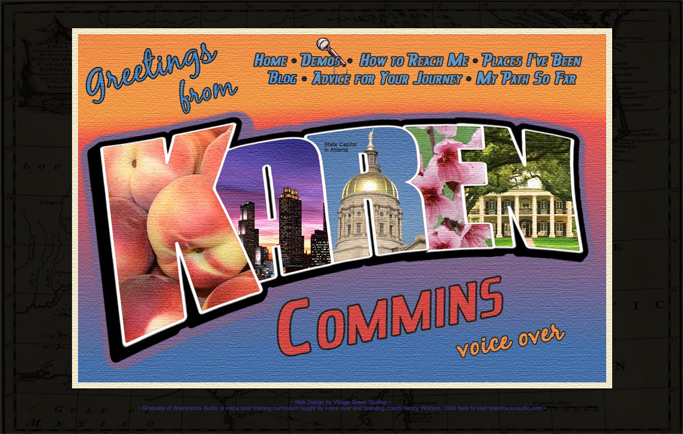 I slate my auditions with “Greetings from Karen Commins”. My salutations on e-mails, forum posts, cards and letters is “Greetings” rather than “hello”, “hi”, etc. My USP is now A Vacation for Your Ears. Being a professional voice talent means that I’m opposed to static, whether it’s on the airwaves or in my career. And Einstein was right — imagining something better in my branding efforts has always stimulated greater progress and my continual evolution, not to mention more clients!